Companies which want to stay in compliance with the federal, state, and local lawscould greatly benefit from the roll off dumpster covers. The use of such covers will greatly reduce disposal and liability costs while preserving the environment. Get Compliant or Be Fined! Companies with waste container lids have to close them at the end of every business day or during working brakes. The containers without lids must use special covers or other methods to reduce pollution. In recent years, pollution from stormwater runoffs has caused serious environmental damage. The EPA often has to deal with such issues. The new regulations ensure waste containers will have proper protection against similar hazards. Any company which refuses to follow the new law will have to pay harsh fines. They range anywhere between $2,500 and $25,000 per day. There are six types of activities which can greatly increase the chance of stormwater runoff occurring. One of them is waste management. Every factory or facility uses some system for waste containment and disposal. Therefore, it is of vital importance companies learn about the danger of stormwater runoff. They have the obligation to securely store their waste in special areas or safely remove it without harming the outside environment. The risks behind stormwater runoff are high. They could lead to a chain of negative environmental effects. Some of the water from rains or melting snow does not seep into the soil but remains over the ground. While it could partially evaporate, most of that water will begin picking up pollution from cars, buildings, facilities, and other sources. The real problems occur as soon as the water reaches local rivers or lakes. The federal government has laws on how to cover dumpsters, but there are additional regulations depending on which state or city a company conducts its operations. According to the EPA and independent researches, some of the hazardous materials from stormwater runoff could include nitrogen, grease, litter, phosphorous, and more. The water contamination can seriously impact the quality of urban surface waters. Every company which deals with dangerous waste must have a Storm Water Pollution Prevention Plan in place. One of the most common problems when fighting against stormwater runoff would be dealing with open dumpsters. If there is nothing stopping the pollution from escaping during heavy rainfall, the local environment could suffer serious damage. Dumpsters without a cover or proper seal could lead to leakages and water contamination. Therefore, waste containment is the first thing a company has to do to avoid stormwater runoffs. Any company conducting construction, manufacturing, recycling, or similar processes has to deal with waste management. Roll off dumpster covers could be of great help here. They provide an efficient solution when dealing with stormwaterseepage. 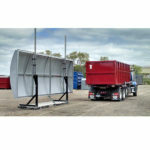 The roll off dumpster covers are easy to use, affordable, and will protect companies from fines. The covers also protect the dumpsters by blocking rainwater and other chemicals from entering inside. Unlike years ago, there are strict federal and state regulations now. Companies must find a cost-effective solution for covering their dumpsters. Roll off tarps or bow systems are a solution, but they are often ineffective. Such materials could easily tear apart and begin leaking waste. 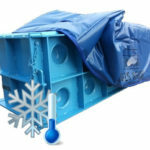 During the cold winter, tarps could freeze which makes them hard to use. Tarps are not effective during heavy snowfall or rainfall as they would be blown away. Companies which are using themrisk of receiving noncompliance fines from the EPA. Roll off dumpster panels are a better solution. They are 100 percent recyclable and do not require any hardware. The dumpster does not need any modifications because the panels will fit easily fit. 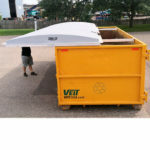 Businesses which want to obtain the No Exposure Certification For Exclusion or ISO14001 could use roll off dumpster covers. Some people from the industry fear they could receive large fines for keeping their dumpsters open. As time passes, the regulations on preventing stormwater runoff are becoming tougher. The roll off dumpster covers will help companies stay in compliance with the law and avoid fines. The covers are cost-effective because they reduce tipping fees. If the waste is soaked in water or frozen, its weight will be larger as well. Disposing of such waste will cost more. The roll off dumpster covers will offer protection against thieves after valuable recyclables or curious children. The recent EPA regulations will punish companies which allow such incidents to occur. In the end, roll off dumpster covers will save companies a lot of headaches. The covers are efficient, great at protecting the environment, great in keeping facilities clean, and will help owners stay in compliance with the recent regulations. 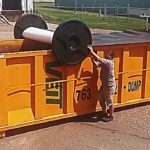 Construction sites, industrial factories, warehouses, and other facilities could make great use of roll off dumpster covers. The covers are easy to use and affordable. They offer a simple, permanent solution to waste management and protect businesses from the new fines. Snow, rain, outside materials, or intruders will have a difficult time entering into the dumpster. While such covers are a common solution, most companies didn’t bother using them in the past because there were little to no regulations. Things are different now. The new regulations from early 2017 are tougher and have strict enforcement over industrial facilities. 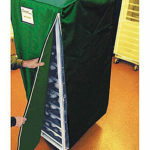 The need for efficient covers is greater than ever before. 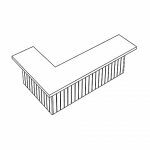 The roll off dumpster cover is an ideal solution for companies who want to stay in compliance with the law and avoid unnecessary fines and fees. 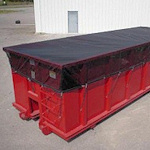 Most industrial facilities choose to use a roll-off tarp instead of a proper cover for their dumpsters. While the tarps could last for awhile in an area with a calm climate, they will quickly begin to ruin themselves as soon as heavy snowfall or storms arrive. The tarps are not a good solution if a company plans on using them often. They are quick to sag, leak, or tear apart. For industrial complexes in colder regions, the winter will be troublesome, as the tarps will freeze and be difficult to work with. These companies risk noncompliance with the new CGP regulations from the EPA. The roll off dumpster panel is a different story. It can last for long periods of time, endure harsh storms, and keep the waste in check. The panel requires no modifications or hardware during its installations. The roll off dumpster covers have greatly helped businesses in obtaining SWPPP Certification as well as ISO14001. The stormwater regulations are tough and threaten any noncompliance company with serious fines. Even the industry leaders are taking action in covering their open-air dumpsters. The roll off covers are the right solution. They will help make your business fine free and help keep it in compliance with the CGP regulations from the EPA. Some companies result in tipping the visiting inspectors and thus avoiding fines. However, the roll off dumpster covers follow the law 100 percent. They will keep you out of harm’s way. The covers we offer are cost-effective for other reasons too. If an open-air dumpster’s waste gets soaked in water, or ice starts appearing, the weight will go up. Therefore, you will have to pay extra disposal fees. Sometimes, dumpster divers will search for recyclables and end up making a mess. Although you are not directly responsible for it, the CGP regulations might still accuse you of noncompliance. Save money from potential fees by preparing in advance. Smaller disposal fees, fewer liability issues, and a complete lack of fines. Saving money is not the only important thing. You will also keep your industrial facilities clean and protect the local environment. Make the right choice and use ALCO’s roll off dumpster covers. What Are The Best Management Practices For Erosion And Sediment Control? The best management practices are the most effective and practical methods in dealing with nonpoint sources pollution. EPA says there are different types of BMPs depending on what sites a company conducts operations as well as if the area is flat or has slopes. Normally, areas with slopes require more erosion controls. While flat or small areas also need some kind of protection, their costs are much lower. Companies must use BMP solutions to deal with stormwater runoff issues. The New Jersey BMP Manual From April 2004. Here, you will find the different, mandatory stormwater management standards. The manual provides help in addressing the standards and preparing the necessary protection. You will find examples of what to do in specific scenarios. While these methods are worth reading and following, there is nothing stopping businesses from discovering and implementing other management practices in order to achieve the NJ standards. The New Jersey Departments of Agriculture, Environmental Protection, Community Affairs, and Transportation worked together to provide the manual. Municipal engineers, consultants, contractors, and environmental organizations also took part in the process. The National Storm Water BMP Database. It provides access to performance data from around 700 BMP archives. Here, you can find studies, performance analysis results, tools for use, monitoring guidance, and other publications. You can search, read, and download the information. As time passes, more studies make their way to the database and enrich it. The database was developed thanks to the Urban Water Resources Research Council, US Environmental Protection Agency, American Society Of Civil Engineers, The Federal Highway Administration, American Public Works Association, Wright Water, and Geosyntec. During the summer, we tend to spend more time outside. It is not fun staying inside all day. We could take long walks, exercise, or meet with friends. However, there should be time for rest as well. If you want to do it outside, the best solution would be to purchase patio furniture. It is great for relaxation, family dinners, and colleague meetings. Patios are also durable and easy to take care of. They can also increase the value of your house. The process of selecting outdoor furniture can be annoying. Where do you buy it from? What sizes and colors should it have? What about the price? Who will deliver it? These are only a few questions you should ask yourself before going any further with the purchase. If you do it right, you will increase the house’s living space and have a new location for family dinners. Choosing the best outdoor patio is also a way to express your personality and creativity. Today’s blog will give you some tips on how to purchase the best patio furniture for your garden and how to take care of it. Unlike indoor furniture, you will need to make some extra preparations. How is the weather in your region? Does it rain often, or is it dry? Are there strong winds? Make a small list of negative weather effects which often occur and purchase a custom patio furniture cover. Preparing in advance is important. Take extra cautions if you live near the beach. Using teak or cedar furniture could be a good solution, as they will prevail in these conditions longer. Order a custom outdoor sectional cover and you are good to go! It is all up to you on this one. There are countless choices. There are no restrictions for natural wood or aluminum colors. You need to think it through. A good idea would be to combine the patio with your house’s colors. If you leave in a warmer climate with evergreen forests, you could set a lively purple patio. Any shade of green can also improve the looks of your outdoor furniture. You can play around with different options until you come up with the best decision. You can change the colors through the use of pillows or cushions too. Buying a cover is also a great idea. It will offer protection while looking stylish. ALCO’s custom outdoor table covers are an amazing example. They will protect your furniture during the harshest of weathers while looking amazing. Take a long tape measure and go outside. Always take into consideration two things – how much space do you have available and what shape does it take? Do you want to use a long but thin balcony? Or the garden which has a square-like shape? Do you want to cover almost everything, or need a lot of free space so people can easily pass by? Do you want to save some empty space for the children? Depending on how much space you have available, you should choose what to order. A normal bar set with a table and some chairs could be enough for a small space. A large sofa requires more space and extra protection. One more thing to do would be to save some free space for a small warehouse or storage facility. Should the weather ever get tough, you might want to move everything over there. If the weather is bad enough for anyone to go outside, it might be hazardous to your patio set. One idea would be to purchase universal-for-use furniture. Keep it outside during the hot summers and bring it back inside when the snow starts falling. Another idea would be to purchase an easy-to-fold patio set. By doing this, you can easily store it inside the house during storms or strong winds. One final solution for both space and protection issues would be to order heavy duty custom waterproof outdoor furniture covers. They can withstand extreme conditions while allowing for air to circulate underneath the furniture. By doing this, your patio set will remain in good shape during the entire year. The previous question was how much free space do you have? The next question is – what type of space is it? Is it next to the house or away in the open? Does it have an overhead cover? It is on top of paving slabs, or the grass? Picking the right location will be beneficial. Your patio will have better protection, comfort, and an amazing style. A good example of what not to do would be placing wooden furniture on grass. The moisture from the ground will begin ruining your chairs and tables. The same effect could affect metal furniture. Dealing with rot or corrosion can be annoying. While fixing them is an option, you would need to spend time, efforts, and money. Avoiding negative effects altogether is a better solution. Once again, ALCO’s custom waterproof outdoor furniture covers could save you a lot of stress. If you want to place the patio in the middle of the yard, the searing hot sun would also be a problem. A foldable umbrella will be perfect for the occasion. If the woods are right next to your yard, use their shadows and save money. There is another thing to note. The sun’s UV rays can also be dangerous for your furniture. They can ruin the color scheme and begin causing deeper structural damage. Our custom furniture covers can offer constant UV ray protection. There are different types of materials and you should carefully choose which ones to purchase. What is the usual weather in your region? How much time and efforts can you spend caring for the furniture? Doing some homework will save a lot of future efforts as well as headaches. Every material has different properties. Some can be resistant to moisture, but others will begin rotting and falling apart. Some can stay under the sun for months and still look brand new, but others will fade away and lose their style. People purchase outdoor patio sets for relaxation and style. The negative weather effects can ruin both. Choosing the right material is vital. Taking care of your furniture is another important concern. Aluminum for example barely needs any care. Polish it real quick and you are good to go. Other materials require special care. Can you afford cleaning them all the time? Wrought iron is strong and stable. It can last for long periods of time without suffering a scratch. Neither rain nor heat can crack it up. Resin will keep its fresh looks for years to come while offering a huge choice in colors. Materials such as mahogany or wicker look good but require dedication. They bring serious responsibilities. If you want them, be ready to spend more time cleaning and taking care of them. You can find more information on every popular type of material and when you should use it below. Going for cheaper options is usually not worth it in the long run. Going for the most expensive options might guarantee quality, but is it really worth it? You need to find a balance. Having cushions would be amazing, but you can save up some money by avoiding them. If you already got some lying around and they match the patio, use them instead. You can also make your own cushions. As long as their materials are mold and mildew resistant, you are good to go. There is one more benefit for having pillows and cushions – you can store them inside the house during colder months. Your budget is the determining factor. Try to get the best possible quality with the money you have, as cheaper patios could break down quickly and result in long-term losses. However, do not overspend. Stay within your budget. Since the main reason for buying an outdoor patio is relaxation, comfort should be priority number one! 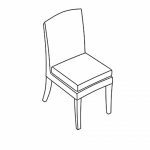 Sit on any chairs and decide for yourself – are they comfortable, and will everyone else like them? People who spend little time outside can purchase normal chairs, but those who like hosting long family dinners or events should get top-quality furniture. You need something durable with cushioned seats. If your friends, family members, and coworkers are going to spend the entire day at the patio, you should make it comfortable. Choose a few, good custom deck furniture covers which perfectly fit your new patio set. A great video by The Home Depot will show you more tips on how to choose the perfect patio furniture. Here is a list of common furniture materials. We will discuss their benefits and give you some important advice on how to take care of them. Wrought iron has superior protection against the negative weather effects. It is extremely heavy and requires powder coating against rust. With some cleaning efforts, you can maintain its looks for years to come. You will likely need to add a cushion for better comfort. You can use normal or green soap while cleaning the patio set. It is cheap, light, easy to clean, and stackable. Like aluminum, you will need little time for cleaning. There are different colors to choose from. Plastic can also resemble other materials such as wicker. Mold and mildew buildup is a serious problem, so clean thoroughly and rinse with water. Wicker looks good, is light, and comfortable. It is a great material for both indoor and outdoor furniture. There are different color choices. Cleaning could be tricky because you need to cover all possible angles. Using detergents or washing powders could be useful. A common choice. 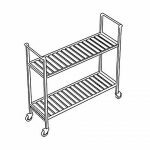 Aluminum is affordable for any budget, light, easy to clean, and extremely durable. You can use a simple piece of cloth when polishing it. The material will save you a lot of time and efforts. It can become hot under the sun, so always put an umbrella above it before using it. Aluminum has different color options and can be durable. That gives you can an abundance of choices. Flexibility is key. Add in some UV-resistant hardware, and you are good to go. You can wash aluminum with natural soap and white vinegar. Add car wax for surface protection. Steel is durable and strong. It weighs more than aluminum. Direct sunlight can heat it up so badly, nobody will be able to use the furniture. Purchasing an umbrella or custom outdoor chair covers will do the trick. Go for stainless steel because it will save maintenance money. Furniture without stainless steel needs a protective finish during cleaning. It is solid, heavy, and long-lasting. Wood does not absorb heat. It can be an expensive choice, so be careful. Wood requires great care. You might need to purchase preservatives against weathering. Wood can also lose its original colors quickly if you leave it without protection. If the furniture is old, look for splinters. Bring it back home during the colder months. If you plan on putting a cover on top of your wooden patio furniture, never let the cover touch the ground. Air circulation is important for the patio’s well being. Doing so will increase its lifespan. Ordering a custom quote is quick and easy. Measure your outdoor furniture and send us the details. Your new, custom patio furniture cover can use a basic shape or a unique design. You can draw a sketch or take a photo of it, and we will use it when creating your custom made cover. You also have a choice between 12oz and 18oz vinyl. There are other features such as splits, tie downs, and more. Custom made to your exact size and form. You can choose from different features and applications. You can give us the dimensions, and we will give you the best covers possible. There is a price to pay for owning any type of outdoor furniture. The negative weather effects can easily damage your tables and chairs. 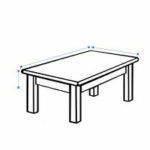 It is important to measure your furniture’s sizes and take their form into account. Preparing in advance will help you find a proper and fitting cover. Here, is where ALCO Covers come in. Whether you need a square patio table cover or waterproof patio table cover, we can help you make a perfect choice. They are perhaps the most serious threat to your outdoor furniture. The sun’s UV rays can cause all sorts of damage. Any wood furniture can suffer color fading or bleaching. The damage occurs slowly over time. If you keep the chairs and tables out in the open all the time, they will begin worsening. It is possible to fix them, but that could cost you big time. One more thing worth mentioning is the wood will become weaker as well. There are risks of breaking or splinting into small pieces. Metal furniture can get hot under the sun and will be unusable until you cool it off. The same rule counts for similar materials as well. An outdoor picnic table cover would do a great job for this occasion. The custom made cover will offer excellent protection. Your furniture will remain as strong and colorful as always. Rain can be annoying to deal with. Things get worse if you live in a rainy state. Protecting your outdoor chairs and tables should be a top priority. First of all, water makes using outdoor furniture uncomfortable. You cannot sit nor put anything on it. If there are soft pillows or blankets over there, things could get worse. It feels as drying can take forever. As soon as that happens, you will discover nasty stains on your furniture. Having to clean them every time a storm passes by is a nuisance. As soon as the moisture soaks in, it can begin causing structural damage to your furniture from the inside. Wood will start to rot away while metal will rust. It is advisable to avoid both hazards. Similarly to UV damage, you can fix the issue. However, this solution is not worth it in the long run. If you want to maintain a good-looking garden or café, there is a better choice. You can avoid coughing up extra expenses and spending more time by investing in proper protection. ALCO’s outdoor table cover square is a great example for the occasion. It is waterproof and offers excellent protection from rain. The cover will allow air to circulate below the furniture. Its material will allow raindrops to slowly fall off. Our outdoor table covers are a perfect fit for any type of furniture you want to protect. Ordering a custom quote is quick and easy. Is your outdoor furniture next to a tree? During fall leaves can completely cover up your outdoor furniture. It can happen during other seasons as well. Things get worse as the weather becomes windy. Even without rainfall, the wind can send flying debris at your furniture. Examples are dirt, branches, leaves, and flying rubble. That could be an annoying problem to deal with. ALCO’s outdoor table covers with zippers are a perfect solution as they can withstand strong wilds while providing excellent protection. As weird as it sounds, animals can also mess up your outdoor chairs and tables. Their droppings can mess us the look of your furniture and ruin your plans for dinner. Squirrels are a major nuisance as they will start chewing on your pillows and rip everything apart. Insects are by far the worst. They will begin burrowing in holes and might create nests. You can avoid these issues by purchasing a custom made cover. It will take the hits while keeping your furniture secure. You can wash it with ease and save time, money, and efforts in the process. Here are some general tips on how to protect and extend the life of your outdoor furniture. Knowing what to do during different seasons is important. During the summer, it is vital to keep your outdoor tables and chairs dry and clean. The UV rays will start damaging them otherwise. While most types of furniture can withstand some negative effects, it is better to not risk it and prepare in advance. Always make sure the surface and cracks are dry as mold and mildew can begin building up. Do not forget to brush off pollen as well. If the surface gets dirty, some stain remover can be of help. Do you want your outdoor tables and chairs to maintain their good looks? Always cover them during the winter. A combination of snow and cold temperatures can seriously damage your furniture. Two perfect solutions would be in a shed or by using our custom made, waterproof patio table covers. Tarps are risky to use because the wind can blow them away. Always tie them good to avoid that happening. Remember to leave some open space for air circulation. Before the new season arrives, do a check up on your outdoor furniture. Make sure everything is ok before covering it. If there is some structural damage, fix it. You should also remove stains. Such problems could worsen if left unchecked for months. Before doing anything else, check your outdoor furniture’s dimensions. They must fit perfectly or you risk purchasing a cover for nothing. Some clients ignore this and face serious issues later on. Make sure the cover is slightly shorter than your furniture to avoid dirt and water reaching it. A shorter cover will also allow air circulation which is healthy for your outdoor furniture. Umbrella covers. Our umbrella and parasol covers are of top-quality. These heavy-duty covers can withstand the negative weather effects for years to come. They also come with an amazing warranty. ALCO offers a number of other products as well such as outdoor table covers rectangular, outdoor table cover square, outdoor table covers with zippers, and more. Grab a tape measure, measure the dimensions of your furniture, input them into our online form, select the features, and place your order. It doesn’t get any easier than that. Every manufacturer provides products of different quality. Some covers might survive a small dew but cannot stand a chance against fierce storms. Others can provide protection for a couple of months before falling apart. Purchasing the wrong cover could be costly, as it will absorb and moisture rather than reflect it. Our covers use superior materials that are formulated for outdoor use. They let the raindrops roll off and keep the outdoor furniture dry. One frequent defect from big box stores’ covers is the seams. They are stitching points which can leak water during heavy rain. Avoid having drip marks by choosing ALCO Covers. Storms with strong winds can blow your covers away unless you can tie them down. When looking for a new purchase, make sure the cover has ties which will keep it safe. You can avoid any hazards by purchasing one of ALCO’s outdoor table covers. Our top-quality, heavy duty, custom-made furniture covers can offer yearly protection while looking stylish. They are easy to clean. There is no need to worry about UV rays, rain, snow, dirt, or debris anymore. With our covers, your outdoor furniture will be safe and sound. The ordering process is quick and easy: take measurements, choose the special options, and place your final order. To start with, you can choose different categories such as sofas, dining sets, ottomans, benches, fire pits, umbrellas, grills, smokers, swing sets, and more. You can also choose between features such as color, cover splits, tie downs, and more. Our Vinyl covers can withstand extreme weather conditions. It has high tensile strength and is resistant to mold and mildew. Not only the material, but its seams are waterproof as well. Our warranty for any patio furniture covers is five years. Shipment times for custom made covers are short – usually between five and seven days. Our resource center has answers to common questions. What is the widest size of the curtains? 20’W x 20’H for all pull up and roll up curtains. What is the biggest size of the curtains? 20′ W x 20′ H for all pull up and roll up curtains. Maintenance culture is the key to a successful business. By purchasing ALCO’S Custom Made Machine Covers, your equipment will always be safe. With over 60 years of experience in the manufacturing industry, we assure nothing less than quality products and services. By covering your equipment, you can prevent unnecessary exposure to elements that cause damage. When using a cover, people will know the equipment is not active at the moment. Using a cover for your machinery is a precaution you should take to ensure its durability. Equipment of high standard needs appearance and maintenance of a high standard. Covers prevent entrance to rodents and other kinds of pests. The electrical and moving parts will be safer. We want to help you by protecting and preserving your equipment. The goal is to ensure lasting usability. If you don’t know the dimensions of your equipment, our sales representatives will come and take measurements. We will give you a quote as quickly as possible. We take specific jobs which require in-house patterning for a custom fit. We will meet in advance and complete your job. By doing this, we will reduce the downtime. We have a collection of fabrics in stock. We can offer you different materials and colors for choice. We care about your equipment and its maintenance needs. We show our dedication through our skilled craftsmen and their work. Quotes for every custom cover are free. ALCO’S Tarps provide equipment protection at a reasonable price. The reasons behind this are simple: our tarps use high-quality materials like canvas, vinyl, and other components. Our covers not only ensure the best fit but also provide protection from weather conditions and other elements. Our covers have custom sizes. The idea is to find the best fit and prevent weather effects like wind, water, sunlight, and others from entering. You will not find a weak spot. Unreliable covers can cause small, but persistent damage. However, you will not encounter that issue here. Our performance is outstanding. The custom made machine covers are sewn to handle virtually all sizes of equipment or machinery no matter the complexity. We offer the following with our custom covers: full protection from sun and other elements, a safe environment, incredible durability, and ease of use during transportation. Our sales staff will work with you and produce the right cover for your needs. You shouldn’t wait any further. Call in now and get the best equipment covers. We understand that corrosion, moisture, dust, oil, water, UV ray, rodents, road grime, scratching, weather condition, bad temperatures, and other dangerous effects can post a risk to your investment. If you want to store and transport heavy equipment, our custom machine covers will do the job. The priority is ensuring our end client’s satisfaction. Protect your investment the proper way. So far, some of our previous customers had issues with their larger equipment. Sometimes, covers do not fit the specific shape, are not big enough, or are too expensive. ALCO’s large equipment covers will amaze you. They can protect large machines, fit in every shape, and are affordable for any budget. With over 20 years of experience in the industry, we can create a custom cover every piece of equipment you have. ALCO’s 5 sided machine covers have gone beyond the imaginable in providing protection for your industrial equipment. In the production process, we use advanced fabrics. The idea is to prepare for all sorts of environmental hazards which could damage your equipment. Since the negative effects of the weather are hard to predict, it is always a good idea to have a cover in handy. Our covers are tough, lightweight, and easy to install or remove. They keep equipment safe from dust, moisture, dirt, and road debris while also preventing etching, scratching, and all forms of physical damage. Are there any good reasons for not investing in covers for your machines? Call us now, and we will recommend the best vinyl equipment covers cover for your needs. We use waterproof fabrics. They can offer protection against different hazards. We take pride in our covers because they can suit your equipment no matter the colors or business logo. Getting a cover for your equipment is not the only thing to look out for. The cover must be strong enough to endure in harsh environments. ALCO’s custom machine covers have the right features to withstand environmental hazards and last as long as possible. The following practices are important if you want your custom machine covers to reach their complete lifespan. Call us now, if you are having issues with your vinyl equipment covers. We will help you by immediately fixing them up. Call now to confirm your equipment dimensions and make an order. When using large equipment covers, be sure to place your equipment in positions where disturbance is impossible. Leaving your tables and chairs without protection can lead to damage by sunlight, water, dirt, leaves, dust, salt, animals, and insects. AKON provides a wide range of custom made outdoor table covers to help you secure your patio. Our collection can offer you different features and give you the choice to pick whatever you feel is best for your backyard. What Are The Risks When You Leave Your Outdoor Table Without A Cover? It is always better to prevent than cure. If you start searching for a cure, the situation is probably bad and expensive. When purchasing a new outdoor table to beautify your backyard, you should also get some protection. At first, a cover might not seem mandatory. However, as soon as winter arrives, things will be different. A time will come when you will need a cover to avoid severe problems. The weather can cause severe damage to your furniture. If you are unlucky, this can cost you a lot of money. Sometimes, repairing will be too much of a hustle too. 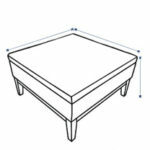 The best solution would be to prepare and purchase a custom outdoor table cover. Although it doesn’t look destructive or threatening, it is the biggest risk to your furniture. The sun does both physical and structural damage. Most people who enjoy their backyard forget about how important safety is. Without a proper cover, the effects of the sun can cause serious damage to your furniture. If the outdoor tables and chairs are wooden, the risks are even higher. You could go for a reverse damage process, but it is difficult, time-consuming, and expensive. The wood gradually becomes weaker the more time it spends under the sun. Metal furniture can also suffer from UV Rays. During the summer, such types of furniture can be hot and uncomfortable to sit on. If you want to avoid sun damage, you will need a custom filled outdoor table cover for the job. By covering your furniture, you will extend its lifespan and keep it looking new. Leaving in an area with unpredictable weather shouldn’t stop you from relaxing in your backyard. All you need to do is take measures in protecting the outdoor furniture. Sitting on wet chairs or eating on wet tables is not fun. If you forget to cover everything before a storm, water stains might appear afterward. The removal of these stains can be expensive and time-consuming. Water, like the sun, can affect both metal and wood furniture. The negative effects could rust or rot. 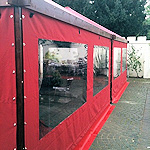 You need something to protect your furniture from rain, and ALCO’s cover is the best choice. Our custom made outdoor table covers will not allow the water to in but will improve air circulation. The idea is to keep your furniture dry and free from moist. You will experience problems with dirt and leaves if your furniture lies under trees. The falling leaves can be annoying to clean and might get inside table cracks. Pollen is another substance that can dirty up your furniture and yard. Pollens come from various trees; usually during the spring. When that happens, the car and furniture will need extra cleaning. You can save time, efforts, and money by buying a custom fitted outdoor table cover. Cleaning will suddenly become quicker and easier. Have you experienced a scenario where you come into your backyard to find animal droppings on the furniture? It is hard to tame the wild animals, but you can stop them from making a mess in your yard. The larger ones can destroy a cushioned chair. Insects can start building nests inside. Prevents any form of destruction from animals by putting a wide cover on top of everything. The furniture size should not be a problem because we have covers for big and small alike. Protection would be great if you have a dining table with sets of chairs around it. It would be cost effective if you can get a cover for everything at the same time. It would be easier to take on or off. The costs should be smaller. The shape of your furniture should not be a problem either. We can offer covers for different shapes of furniture, and they come in unique colors. ALCO covers provide wind protection for the most stormy climates. The first collection on our list is 18oz Vinyl. It looks astonishing. The design is elegant and can easily entice your family, friends, colleague, and neighbors. The beauty doesn’t affect its durability. The cover has a thick, 18oz VInyl polyester reinforced construction. The material retains colorfast properties absent in lesser quality covers. We combine waterproof lining work in conjunction with a waterproof binding to enhance the moisture wicking ability of the material. Another feature of this cover is the presence of buckle straps. The warranty is at least 5 years. The design has a specific goal - to tone with the backyard. These covers come with double contrasting stitched seams, piping, webbing, and handles. Both front and back vents have protection. There is a stable air circulation below the cover which will prevent mold and mildew. ALCO’s 18oz Vinyl covers are functional, strong, and can last longer. By reading this article, you will acquire important knowledge. It should help you in choosing the best custom outdoor table cover for your yard. There is no need to fix the damage when you can easily prevent it in the first place. With ALCO’s selection, you will find the right cover for your outdoor furniture. Protecting your furniture from specific hazards can be an overwhelming task. Cleaning and repairing the damage is often not an option. Purchasing Custom Made Outdoor Furniture Covers can be easy with these simple steps with this better solution. If you want to save on extra expenses, you will need to understand the different types of covers and their benefits. To help you stay in the right direction, we created this guide. Continue reading to quickly go through any product assortment and choose the right custom outdoor furniture covers. Before making a choice on which custom patio furniture cover to purchase, spend some time going through our product reviews as well. There are different factors to consider when leaving your outdoor furniture without protection. UV rays, snow, dust dirt, pollen, leaves, insects, rain, salt, tree sap, droppings, ice, and others are threats your furniture will likely face during its lifetime. These are the reasons to purchase custom outdoor furniture covers. If you want to purchase outdoor furniture, it is worth to take the time and understand the significance of the threats. You will need to take measures in preventing future damage. Make a list of possible hazards which might damage your exposed outdoor furniture and begin your quick research on the internet. Be sure to check for historical seasonal behavior for your area. People who live in Las Vegas and want to buy outdoor furniture need to search for protection against extreme heat, snow, wind, and dust. Dust and sun rays pose a larger threat to your furniture in that region than most others across the US. Covers should not touch the ground because they must allow for air circulation underneath the furniture. Preventing mold and mildew is important. Also, an oversize cover encourages water pools on top. The right size is important as much as the shoes on your feet or your clothes. To protect your investment properly, you will need to measure the right dimensions. 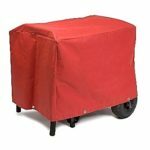 ALCO’s custom size outdoor furniture covers are perfect for the job. Measure carefully. If the cover is too small, it won’t be able to provide enough space or might rip. If it’s too big, the wind might blow it away. Precision is of vital importance. A comfortable furniture size shouldn’t have more or less than 4 inches to space. Not sure about the dimensions of your furniture? Not a problem! 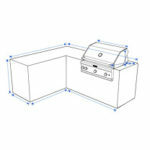 Check our website for all sorts of forms and sizes and discover the perfect shape. Make sure you review all the information and ensure the cover meets the standard of your needs. It is important to prepare before purchasing custom made patio furniture covers or any custom patio furniture covers. As an example, if your furniture has an irregular dimension or the winds in your area are too strong, you might want to consider a 360 drawcord. It is flexible, easy to use, and will provide secure defenses against the wind. After you are ready with measuring your furniture, it is time to proceed by choosing the right custom made patio furniture covers. Add them to your cart and follow the checkout process. You will feel better because your new cover should fit with ease and provide protection against harm. Will you need the cover for industrial uses? Rain is not the only major threat to your furniture outside. Heat, UV light, or salt water can cause serious damage if they come in contact. It is important to buy the best custom patio furniture covers. They will feel like an asset because of their incredible protection capabilities. By preparing in advance, you will be able to preserve and protect every single piece of your property. Purchasing a cover for your furniture is easy, and everyone can do it. However, getting the right cover requires some preparations. The good custom patio furniture covers must use breathable fabrics for the best protection possible. A plastic tarp could be an alternative, but using it is not a good idea. Tarps do not contain breathable fabrics. It is important to look for breathable materials because they allow the air to go in and out. Without air circulation, there is a risk of mildew and molds spreading around the furniture. Non-breathable fabrics can trap moisture and cause damage. If you live in a damp or humid climate, there are different threats for your wood furniture. Wood will begin to warp if you put it in a moist environment. If your current cover is not water resistant, it’s like you have not been using a cover at all. All outdoor furniture covers should provide resistance to water. Try to do a test by pouring some water on top. If the water is flowing towards the edge and starts drying up, everything is good. You can safely make a purchase. However, the water might begin soaking. In such cases, avoid buying a cover at any cost. By using non-breathable fabrics, there are barely any differences than leaving your furniture out in the open. Always perform tests before finalizing a purchase to avoid spending extra money on repairs, maintenance, or getting new furniture. If you observe closely in anything you purchase, you will find the warranties somewhere on electronics and other expensive products. However, in this industry, things are different. It is hard to find a company which produces furniture covers and offers a warranty at the same time. Only a business which has absolute trust in their products will offer a warranty for their covers. Waste no time and purchase from them. The warranty shows that the business cares about their customers. Companies who never offer a warranty pay attention to the manufacturing process. You should avoid them because their products might not offer a good standard. If you are planning on spending hundreds of dollars, the best way to avoid taking risks is by purchasing a cover from businesses who can and will provide a warranty. When purchasing a custom patio furniture cover, it should fit without showing any signs of sagging. The best covers in the industry have designs for various styles and shapes. The covers fit perfectly and will protect every part of the furniture from top to bottom. A patio set cover that fits loosely around the furniture may leave your asset exposures to rain, sun, or even snow. No one would like to go out during a heavy storm to reset their furniture cover, which is why a proper patio set cover is essential. Why waste resources on something which will disappoint you and make you go through the stress of buying new furniture or repairing the old one? Do you need the best cover possible? If yes, make sure to provide as much information as possible. By providing the correct details, you will help us measure the corners and ensure properly sewn seams. Those that come with a zipper will make it possible and easier to cover all parts of the patio furniture. It is important to display a reasonable amount of care towards designing and fabricating any custom size outdoor furniture covers. Always make sure your furniture covers have zippers. It is a standard for protecting outdoor furniture. It is worth spending time on research, as long as you can get proper protection. Durable covers will also look good when in use. They can look attractive and bring out the real shape of the furniture. Purchasing a proper cover for your furniture is of vital importance. It will save you money, time, and trouble. You will be able to relax without fear something bad might happen to your patio furniture. Always make sure the manufacturing fabrics are breathable and offer water resistance. Covers should also be durable. The product should include a warranty of at least one year. Do you have a furniture cover? Did reading our guide create doubts about it? Don’t wait for a heavy storm to arrives, and order for a secure cover instead. Whatever design and color you have in mind for your furniture, we will be able to craft it.